How long have you been a musician? What age did you begin? Country Bo’ Flye: I have been a musician for about 12 years now. I started getting promotion about 3 years ago. I started doing music at age 10. What inspired the name Country Bo’ Flye? Country Bo’ Flye: The name Country Bo’ Flye was inspired by me being from the country parts of my area. The name Flye is my real last name. Who were your musical influences, idols, or bands growing up that have help mold you into the musician you are today? Or helped mold the music that you create? Country Bo’ Flye: Music artists like, Master P and the whole No Limit Record, the group Hot Boyz and the whole Cash Money Records, and 50 cent. Country Bo’ Flye: If i could play with any other musician or band, it will be Gucci Mane, T.I., Eminem, Pastor Troy, Lil Jon and the Eastside Boyz, Rick Ross and the whole Maybach Music Group,Young Money Cash Money, Plies, Lil’ Boosie, Lil Webbie, Bun B, Slim Thug,and Yelawolf. What’s the music scene like in North Carolina? How is it for an up and coming artist like yourself? Country Bo’ Flye: The music scene in North Carolina is not all that great. There are some promoters who book venues to help out up and coming artists who are making a name for themselves in their area. For an up and coming artists like myself, its very competitive. Im one of the hottest artists from North Carolina so i get alot of people trying to compete with me. What’s the ultimate goal you want your music to achieve, or for you to achieve in your career as a musician? Any particular message you wish to send? Country Bo’ Flye: My ultimate goal as a music artist is to leave my stamp in the music industry. To be heard. To have my music shows sold out, with the crowd knowing every line of my songs. The message i would like to send is that, Im built to be a superstar. Im built to give the world great music. What’s the favorite concert you’ve ever been to or performed? Country Bo’ Flye: My favorite concert I’ve been to, and performed at, was when i opened for Def Jam artist “Lil Ru” Mr.Nasty Song himself. Any pregame rituals before shows? Country Bo’ Flye: Yes, on the way to all of my shows, i blast my music the whole way there, rapping my lyrics very loud, Jumping around to my music before i go into the clubs, to perform. Out of all your songs… do you have a favorite, why? What influenced it? Country Bo’ Flye: Yes i have a favorite. My current single “Chicken Pox Money”! With the saying, “My hand Itchin, bands got my hand itchin” as the intro of the song is pure motivation to go and get money. Me being from the country and the superstition when your hand itches you have money coming to you is what influenced the song.I just thought way outside of the box with it. What’s your favorite aspect of being a rapper? Country Bo’ Flye: My favorite aspect of being a rapper, is that i can hear me and find myself while listening to my own music.When i do, i sound industry. That’s why i do music. How do you believe the Internet helps the music industry or you as a musician? Country Bo’ Flye: The Internet helps me as a musician to sale my music online, and to connect with my all my fans on a social level. I can put a Facebook status up about any new updates about my music i have coming soon, also can i tweet it on Twitter. My fans can see my videos and hear unreleased music that didnt make a specific CD project. How do you like to spend your time when you’re not creating music? Country Bo’ Flye: I spend most of my time creating music. But when im not, i like to spend time with my family and meditate. Anything else you wish to say about yourself or your music? Any message to your fans? Country Bo’ Flye: Country Bo’ Flye will bring the best of the best music to the table. I will continue to drop hot songs, verses, and choruses. I have my own lane in this music industry. Today, everybody is a rapper. I have to seperate myself from the rappers who are just rhyming. I make music. All kinds. 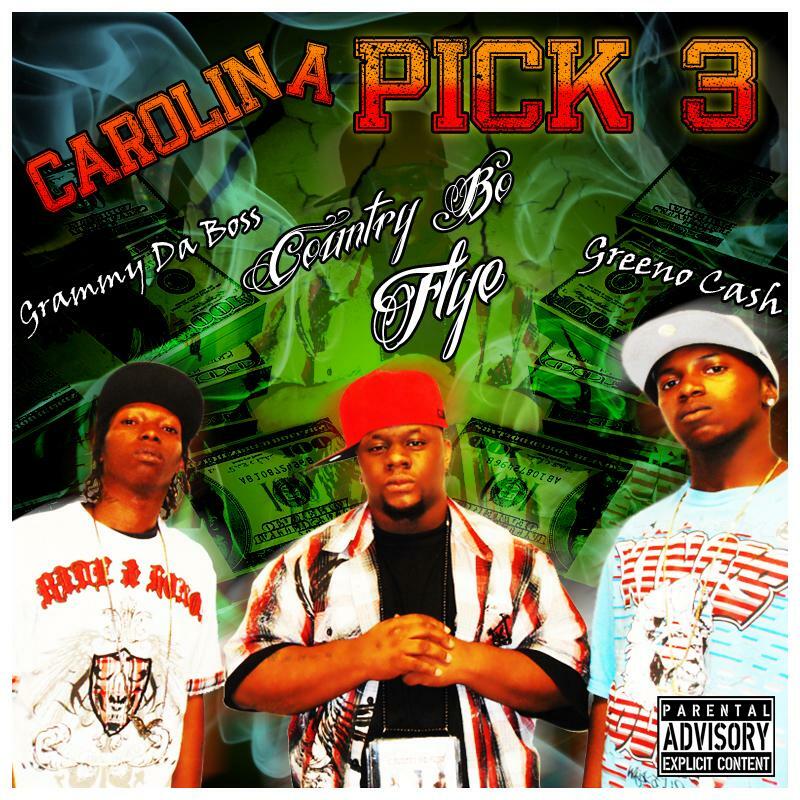 The “Carolin Pick 3” Mixtape is now available. Stay tuned for my new single “Stoopid Dum Yum” prod. by Outta Town Shawty. Thanks for all the love and support from all my fans.